Sad news on the crazy kitty front: Miss Smokee seems to have disappeared. We haven't seen her for a meal (which she made like clockwork) in about a week and a half. Matthew and I were freaking out about what to do about the kittens last Friday, which was about three days since we had seen Smokee. But our lovely next-door neighbors scooped up the kittens and fed them and cared for them round the clock until a foster family was found. So that was a sweet ending to a sad situation - we're so blue about Smokee. She had become part of our lives. To see her transform from a hissy, swatty, suspicious near-feral cat to have her follow us around the yard companionably and rub up against our legs was really wonderful. And one last note about this whole ker-AZY cat situation. I went to the SPCA last week to see if someone had caught Smokee and turned her in. She wasn't there, but MYSTERY was! I called Matthew and he said, "Put in an application! She can't be put to sleep!" I did, but there were already four applications in for her, so somebody rescued her. And maybe they'll keep her inside, which means no more visits for us, but also no more visits to the SPCA. Okay, I am declaring a moratorium on cat posts for the foreseeable future. 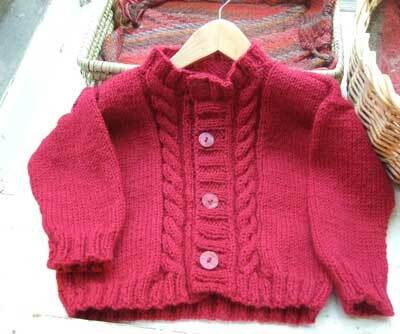 Momogus Knits Child's Cabled Cardigan in Encore Worsted. 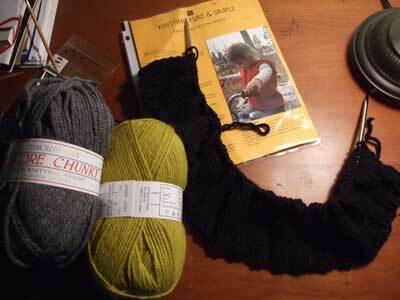 Knitting Pure and Simple Bulky Hooded Vest for Gus in Encore Chunky. He's all about black as the coolest color of all, and I'll throw in some devastatingly cool chest stripe so he can strut his badass 7-yr-old Quaker stuff on the playground. I started this when I got home from work yesterday - 3 to the inch goes FAST! Phillies lost yesterday. Their poor beleaguered valiant bullpen aces (Gordon, Myers and Romero) had to take a rest, so the poor beleaguered and not-as-good bullpen other guys (Alfonseca and Davis) blew the lead. Hamels's gorgeous outing was wasted. I have the strongest feeling of deja vu because THIS HAPPENS EVERY YEAR. In a month, I hope I won't be saying "If only they won 2 more games in April, they'd be in the World Series!" which is what I have been saying for the last 6 years it seems. C'mon, crazy Phillies flag - work your mojo!!! that's the cutest cat pic ever. how do you do it? do you stealthily sneak up on them? intriguing. i should knit up that shawl sample, shouldn't i? it's a friggin' pi shawl and i can't bring myself to work on it. ugh....i'll do it, i swear. 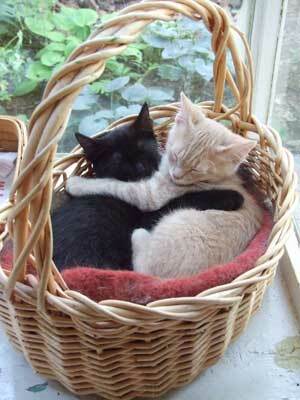 That kitties in a basket pic nearly made me lose my mind! OMG they are so cute!!! HALLOOOO! STELLA!!! Those ding-dang kittens still arrange themselves in adorable positions every day! !